Can you tell me what cultured stone this is, please? It's neat that the wood is stored directly under the fireplace. Haven't seen that before. Could you please tell me the approx height of the raised hearth? - thank you. Would you be able to tell me how high the hearth is off the floor. If the ceiling is 12' my guess would be 8' or 9' off the floor? It would be so helpful to my project. Also can you share with me the name of the method the stone were placed? is that called dry stacked? Thank you. Would you share the company/type of stone? Inviting room! What are the dimensions of the room?Thanks - What is the length, width and height of walls and ceiling? Thanks! Thank you so much for responding promptly! Please: Is the fireplace on the 27' or the 24' wall? And how wide is that fireplace? I want to ensure that our wall is that dramatic. Our ceiling is that high, but our architect is recommending a 6'6" wide fireplace. That seems too narrow. Love the coffee table. Where can I purchase it? It looks like a Woodbridge piece! did you find out where the coffee table can be purchased? Hearth slab - What is the stone used for the hearth slab? The stone used for the hearth is bluestone with rough edges. Love the wood storage right under the hearth. What is the flooring under the wood storage area? Is it the same as the rest of the room or did you put something more durable? I'll check back to the drawings and get back to you asap. Thanks for your interest. Dimensions? - Beautiful fireplace! One of the nicest I've seen. Love how the stone is built out from the insert with the arch. We are modeling our fireplace after this one. We are placing ours in the middle of a 24ft wall. There is a 9 - 11ft span between the windows. Could you please tell me how wide this is, as well as the rough dimension of the actual opening? If possible, I'd also like to know how far it comes out from the wall and how high it tapers. Thank-you so much! Thanks for your interest! I will have to check back to the drawings and get back to you as soon as possible. Greatly appreciate it! We are building the supports for our firplace soon. Your portfolio on this website is amazing... beautiful work. Wish we lived in eastern PA (rather than west side) so we could use your expertise! what is the name of the color and who sells it. Can you tell me the exact color of the trim? I am thinking of using the pumpkin spice and would like to match the trim as well. Also, we are putting down an engineered hardwood flooring called Cambria Oak and installing wainscotting. What would be your thoughts on the color we should go with on the wainscotting? We are going back and forth on staining it a contrasting color or painting it. The windows and doors are stained and I am just really needing advice. I thought if we painted it I would probably try to match what you did here. What type of stone is on the hearth? Beautiful fireplace!!!!! What type of door is on the fireplace? Can it be installed in exsisting fireplace? In New York State, there is a code requirement for closeable doors for energy saving. It should be available at a local fireplace store. Can you please share the color of the curtains please,please,please! Diane Susoev at ECOterior Solutions would know that information. 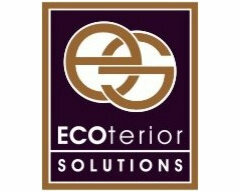 Interior designers, Carolyn Tierney and Diane Susoev at ECOterior Solutions would know that information. Just a comment. Prettiest house - This is the prettiest house I have seen on this site. The whole package. Colors and materials are gorgeous. Simply stunning. Thank you for the wonderful comment and the interest in our projects! How far is hearth raised off the ground? - I saw there was a question about this but didn't see the answer. The hearth is raised approx. 1'-6" above the floor. Need ways to accessorize my brick fireplace - Where was the piece that the flowers are in purchased?? love the mantel! what are the dimensions of the wood mantel? Thanks for the compliment! I will have to check the drawings and get back to you asap. do you have extra support built under center of hearth? what kind of flooring is under wood and hearth? where can I get this chair? I apologize, we have no information on the furniture. Perhaps the interior designer on the job Carolyn Tierney from ECOterior Solutions could be of better help. Where did the drapes come from? I love the color. Thanks for your interest! That would be a question for the interior designer Carolyn Tierney from Ecoterior Solutions. Love the stone. What kind of stone is this? Thank you for your concern we are all doing just fine after the storm. We use the change in trim height to emphasize our doorway and transoms. There is no other reason besides simply for aesthetics. Do you think the pumpkin spice color on all 4 walls would be overwhelming in a den that is 15x12? ceilings - Could you tell me how high these ceilings are? The ceiling height is 10'-6". I love the wall color...anyone know what it is? Where did you get the light fixtures?? Lighting was made for this project by Deanna Wish from Wish Designs. This, folks, is country style done right. In one corner we have an elegant upholstered armchair, graceful draperies and an Oriental rug; in the other, a tree-twig chandelier, a firewood barrel and a wagon wheel propped on the mantel. The rustic accents dress the space down, but its design chops are unmistakable. If you prefer your logs a bit more hidden, create a niche between the hearth and the floor. The floor underneath should be stone; I like it when it's the same stone used on the hearth. Under the hearth. The spot underneath a raised hearth often goes unused. Make the most of it by creating a spot for wood storage underneath. Design tip: When designing for storage under the hearth, keep in mind that a raised hearth is made to sit on. Try not to extend the height of the wood storage past 18 inches, which is the standard sitting height. 9. A bowlful of apples. It's so simple, we should all do this one! Instead of keeping bowls of fruit relegated to the kitchen, pile fresh, crisp apples in a nice wooden bowl and set it on the coffee table. 6. Tweak home decor for fall. Layer beds with thicker quilts, drape a cozy throw over your favorite armchair and set out bowls of apples and nuts. 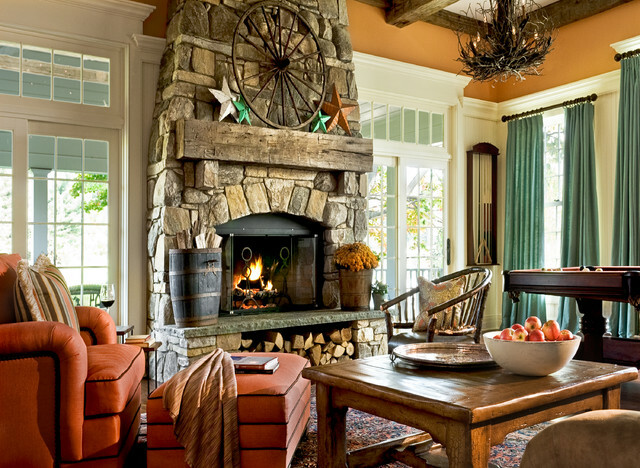 It doesn’t take much effort, and your home will instantly feel more fall-like.7. Savor warm drinks by the fire. Hot cider with a cinnamon stick, cocoa, tea or something stronger — whatever your favorite cold-weather drink is, take the time to savor it. Fireplace optional (but lovely). Raised Hearth for Fireplace for wood storage beneath, Bluestone capped Hearth with Substantial Mantel. Fireplace needs to be 8' wide at Base. Plans to Install 55" Tv above the Mantel area and Inset into the stone with a recessed cavity to block the TV side profile and Then have a Bifold type Door over the TV area to close off and protect when not in use.